Element Designs’ new shelving systems provide complete fully integrated storage solutions for residential and commercial interiors. The modern shelving units combine style and exceptional materials into elegant, easy-to-install solutions. As a leading manufacturer of aluminum, glass and acrylic components in North America, Element Designs’ material knowledge and custom manufacturing expertise make us a trusted partner for any shelving project, whether large or small. Our shelving systems can be used with our custom manufactured shelving products, such as our patented °eluma LED shelving, backpainted glass shelving or contemporary aluminum frame glass shelving. °eCubed Shelving System in jet black finish with white matte backpainted glass inserts. Custom cabinetry featuring low-iron clear glass shelves and aluminum frame glass doors. Image courtesy of Wood-Mode Fine Custom Cabinetry. Kitchen featuring modern eCubed shelving used as an island base and open wall shelving. Shelving featured in oil rubbed bronze finish. °eluma LED shelving in a suspended hospitality application. 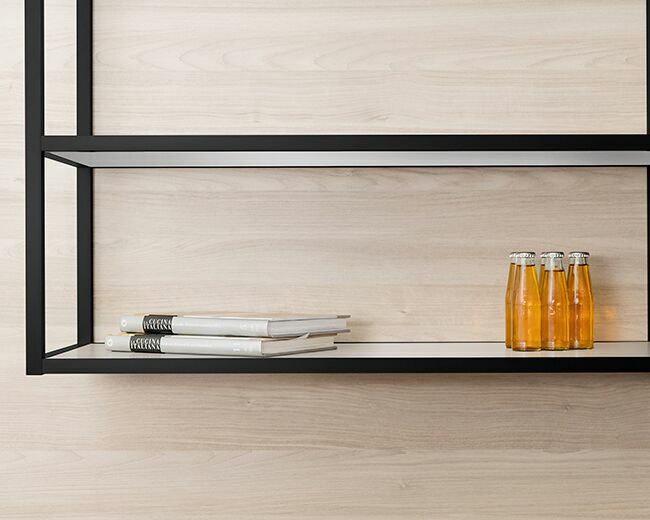 °eluma shelves in EL001 profile, 1/4" etch glass inserts and warm LED color temperature. Courtesy of Nuvole.